Egypt’s President Fattah al-Sisi Sunday officially replaced his Rwandan counterpart as chair of the African Union (AU) headquartered in Addis Ababa, Ethiopia. The summit of the pan-African bloc gave Egypt the Pan-African organization’s top seat, for the first time since 2002. The rotating chairmanship moves every year between the four regions of the organization. The Egyptian leader in an address to his counterparts made the fight against terrorism one of his top priorities. 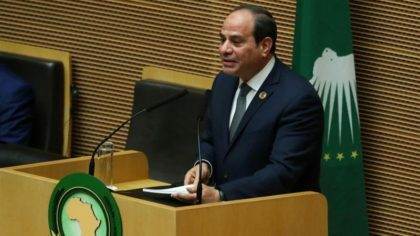 “Terrorism remains a cancer that affects African nations and steals the dreams of our people and we must identify and combat those who fund terrorism activities on the continent,” Sisi said. He also stressed mediation and preventive diplomacy as one of the key mechanisms for promoting peace and security on the continent. The AU froze Egypt’s membership in 2013 after al-Sisi toppled Egypt’s first democratically elected President Mohamed Morsi now languishing in prison.